Around noon the other day (10/18/2017) I passed the CWDP exam. Shortly thereafter I posted to Twitter that I had passed it, and among the likes and "congrats" that were passed my way, a couple of people asked what I used or what my process was. It was these questions that were actually the seeds of starting this entire blog. It finally gave me the confidence that maybe I do have something to share back with the community. Off the bat I should probably provide a little backstory. For the past 6+ years I've been a presales engineer covering all things networking. From route/switch to security to telephony and everything in between including wireless. 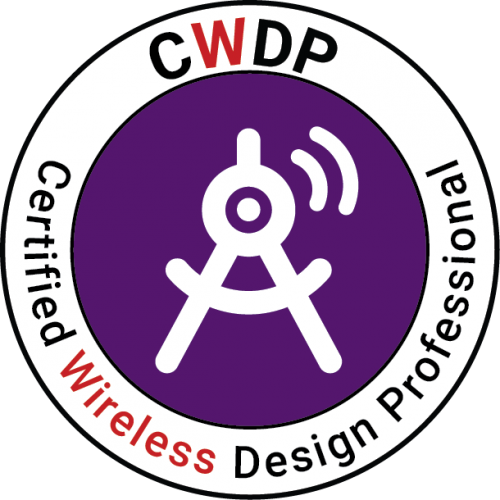 As I progressed through that role, my interest in wireless became what it is today, and I went off and got my CWNA. I had grand plans of knocking out the rest of the CWNE track directly thereafter. But as Jeff Goldblum so eloquently put it in Jurassic Park "Life, uh, finds a way." A few months after passing my CWNA our daughter was born, and the focus I had was long gone. However at the beginning of July, I was granted permission to spearhead a new position as a pre-sales engineer focusing solely on Wireless networking and Mobile Device Management. This jump-started my CWNE endeavors. So although 820 days had passed between my CWNA and CWDP, I only had been truly focusing on it for the past couple of months. Alright, that segue out of the way, lets delve into my experience with studying for the CWDP! What materials to use for the CWDP-302 has been something that has been discussed a fair amount on Twitter and other forums. At first I just assumed that I would buy the latest book written for the newest exam and that would be enough. After all, that's what I did for the CWNA and had success. However when I went to buy the CWDP-302 book, the Amazon reviews gave me pause. I normally read Amazon reviews with a grain of salt. But this isn't a kitchen gadget, or some other every day item you would get off of Amazon. This is a book written by Wireless Professionals, for Wireless Professionals. So I was pretty conflicted after reading the negative reviews about purchasing it, but went ahead and did so anyway because it just seemed to make the most sense. Newest test should equal the newest book right? A few chapters in I saw what the reviewers qualms were. The book just wasn't written to the level I expected. To this point my experience was solely with the CWNA-106 book, which was written remarkably well. The CWDP-302 book just didn't live up to my expectations. It's to the point. I could see this being a great book if you needed to re-certify your CWDP and already had a solid background in everything that it covered. Because it *did* cover all of the exam objectives. Being newer, it does cover some things that the older book did not. It doesn't go too in-depth into the material. There is a reason it has half the pages. Some of the material seemed to be lifted from other study guides? No chapter review questions. However there was a quick summary of the chapter and some "facts to remember." So what did I do? I went back and bought the PW0-250 guide. There were just too many topics that were being covered that I felt I was only gaining a veneer of knowledge on. A veneer is great, it finishes off a product. However that product is useless without solid underpinnings. Which is exactly what I needed. I needed to build the foundation of my knowledge and the PW0-250 guide gave me that. The PW0-250 book addressed a lot of the drawbacks in the CWDP-302 book. It went deep into all of the subject matter. It also had chapter review questions, which for me are incredibly valuable. Often I'm squeezing in a few pages here or there. So being able to review the chapter at the end is great because it shows what I might need to review before I move on. Also, sometimes I can blow through a chapter and think that I learned it all. Only to have the chapter review questions prove me wrong. Which I would much rather have happen at that point, rather than when I'm taking the test. Speaking of tests! I would attribute much of my success in passing on the first attempt to using the CWNP practice exams. These do a great job of showing you where you are weak, as well as solidifying where you are strong. On my first pass through the exams, I have it provide me the explanation of the answer on all questions. Whether I answered them correctly or not. That way, even on correct responses, I get a little blurb about the question and the various answers on it. You would be amazed at how many little tidbits you can pick up from these. After my first pass through the practice exams, I go back and brush up on the areas where I felt I needed work. Not only by re-reading the area in the book (although I did that as well) but I would go to other sources as well. To me, this is an important step. There is a reason that the concept didn't "stick" the first time. So going to another source and having it explained in a different way, or through a different medium such as in a YouTube video, can have a big effect on my retention. I should say that I was a bit disappointed in the tests. For how expensive they are, I expected better quality control out of them. Despite the fact that the PW0-250 book came with practice exams, I purchased the CWNP ones for the new exam to ensure I was covering all my bases. There were a few questions that would say in the question portion "pick three answers" and then on the answer section would say "pick two answers." This might seem nit-picky, but for $125, I don't think I'm too far out of line. My only other qualm was that there were only two pools of questions with 60 questions per pool. That's $0.96 per question. I just wish there were more questions to help ensure that I had learned all of the material. That all said, even at 96 cents per question, I will absolutely continue to use them on the future tests. Establishing where your knowledge needs improvement is incredibly valuable, and these tests are a great way of doing that. I also found the flashcards provided with the PW0-250 book to be very helpful. I know some people do well with flash cards and others don't. So like everything your mileage will vary. Much like Fight Club, the first rule of proctored tests is that you can't talk about the test. What I will say is that if you are prepared, you should do okay. Read every question as well as every answer carefully. Also, remember how when you were learning to read, if you didn't know what a word was, the teacher told you to sound it out? Apply that to questions you get stuck on. Break the question down to the concepts being discussed. This can often help you break down the question and the subsequent answers and figure it out. Remember, you learned all of this not just to pass a test, but so you can apply that knowledge. With those questions that you need to "sound out," you are merely doing what you are going to do once you walk out the door. You're going to apply the knowledge that you have. So approach those questions like you would any problem you encounter. Break it down, and apply the knowledge and experience that you have gained to this point. As with any major accomplishment I think "what's next" is an important question to ask. This may sound like hyperbole, but I think you should always build off of your achievements. So once you've reached your goal, your next step should be to establish your next goal. So for my next goal, it's going to be the CWAP. The track that you should take through the CWNP program is often talked about, but its generally agreed that CWAP provides you with knowledge that will help you with the remaining exams. After going through the CWDP, I agree with that. There were certainly some "in the weeds" type things that having that deeper protocol knowledge would have been incredibly beneficial. So, the CWAP will be my next exam. With that, thank you for reading! If you have any questions, comments, or concerns, just reach out! I would love to discuss it with you.